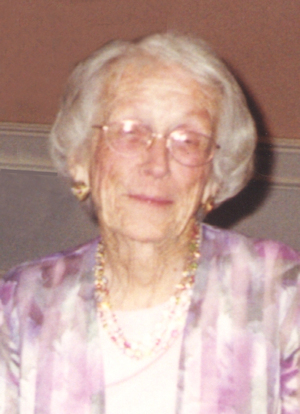 Obituary – Birkes, Emma Mae (Scheinert) « Perry High School Alumni Association, Inc.
﻿ Emma Mae (Scheinert) Birkes was born October 19, 1909 and went to be with the Lord on Saturday, November 4, 2000. Her parents were John Henry and Ernestine Scheinert and they lived near Perry, Oklahoma. Emma married Oris Franklin Birkes in 1934. They made their home in Tulsa where they raised their children. They moved to Moore in 1990. Emma is survived by her children and their spouses: Karen Birkes Schroeder and husband Melvin; Philip Birkes and his wife Cynthia; six grandchildren and their spouses: Lynda Schroeder Stencel and husband Ed; Suzanne Schroeder; Tim Schroeder and wife Diane; Nanci Schroeder Griffin and husband Jason; Rachel Birkes Meinke and husband David; and Rebekah Birkes; three great grandchildren: Bryon, Veronica and Mitchell. Mrs. Birkes was predeceased by her husband, Oris, in 1992 and is interred next to him at the Resthaven Gardens Cemetery in Oklahoma City, Oklahoma.